Those anxiously awaiting the arrival of the 2019 Honda HR-V don’t have to wait much longer. Canadian deliveries are expected in early 2019, meaning you should start to see the new models hit showrooms around January. The Honda HR-V, a relatively new model to North America, has quickly become a popular choice since 2016. Smaller than most SUVs, the HR-V was designed to offer plenty of space without compromising road performance and maneuverability. All in all, the HR-V is the ultimate everyday driver. What can buyers expect with the new 2019 Honda HR-V? The same great subcompact crossover they love, with a few exciting new changes. From the inside out, there’s a lot to love about this new generation. First up, the 2019 Honda HR-V will be available in two new versions: the Sport and the Touring. Each version will complement the existing LX, EX, and EX-L trim levels and will come with their own distinctive look. A few styling updates help enhance the overall look of the 2019s. The front end might look familiar, that’s because it’s styled to look like the Civic and the CR-V by featuring a more prominent black chrome honey comb grille. 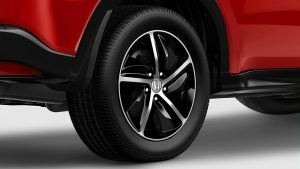 The 2019 Honda HR-V will also feature 17-inch aluminum alloy wheels in available two-tone black. In terms of colours, buyers will also get to choose from two brand new options: Orange Burst Metallic and Platinum White Pearl. Inside one of the biggest improvements is the available infotainment system. The new system features a simplified interface and the return of a volume knob. Additionally, the new system will incorporate Apple CarPlay™ and Android Auto™. In the Touring version, the navigation system has been improved with sharper graphics and 3D landmarks. Both versions also feature a redesigned driver’s meter. The 2019 will be the first HR-V to have the Honda Sensing come standard on all trims. Honda Sensing is Honda’s exclusive intelligent suite of safety and driver-assistive technologies designed to alert you to things you might miss while driving. The new 2019 Honda HR-V will now feature a Continuously Variable Automatic Transmission (CVT). The CVT helps keep the engine running within the speed range in which it is most efficient, thereby improving fuel economy. However, the 6-speed manual transmission has been discontinued for all 2019 HR-Vs. As for the engine, the new HR-V comes with a 141 horsepower, 1.8L 4-cylinder SOHC i-VTEC engine. The HR-V is a great option for those in need of an everyday utility vehicle. From spaciousness to road performance, it’s a car that doesn’t compromise. The new 2019 Honda HR-V is the same subcompact SUV you know and love, with a few exciting upgrades and a more refined driving experience. To test drive the 2019 Honda HR-V for yourself, keep an eye out in showrooms come January.